Why Choose A Custom Wedding Ring Design? Home » Engagement Ring Tips » Why Choose A Custom Wedding Ring Design? While the Egyptians preferred a thin band of gold in a circular fashion, today you can find all sorts of wedding ring designs that imitate the doctor who screwdriver to the ones that look like the stone is hanging in thin air. It’s your choice. It’s gonna be with you for a long long time. With more than 45% opting for a custom wedding ring design, everyone loves and eyeballs uniqueness. So, it goes without saying that to choose a custom wedding ring design is to invest more into your love. It will make your girlfriend scream yes and make you look like the sweetest hussy on the block. But before you do, let’s check the pros and cons of a custom wedding ring design with the engagement ring experts. Ready? We love finding the reality behind engagement rings. Started as a diamond store reviewer, today we provide extensive and comprehensive guidance for brides to be. That’s why today I’ve gathered seven reasons why you should choose a custom wedding ring design assessing the good and bad about it. Let’s find out the reality behind custom wedding rings. Why get a custom wedding ring? Is it cheaper to get a wedding ring personalized to your tastes? What is the real benefit of making your own custom wedding ring design? How long does it take to create a custom wedding ring? When you opt for a custom wedding ring, it needn’t something out of a story tail. Adding a baguette to a wedding ring design you like also creates a custom wedding ring. It will be one of a kind, available no-where else. A custom engagement ring is a 100% unique take on the symbol of your love. Why shouldn’t you have that option? The uniqueness of your wedding ring design is not aware of the masses. You know it. And, your jewelry designer knows it. That’s it. You can even get a patent on it, y’know! That’s why we’d like to add the pride of getting a ring design that cannot be replicated. Everyone who looks at your custom ring will be stunned as there is no other design like the one you have, anywhere. Why do you think celebrity engagement rings are always the talk of the town? Because they are custom made! It will always attract attention, compliments, and questions about the designing side of your jewelry. When you design a custom engagement ring with the help of a jewelry designer, you can go as creative as you want. It is easy to make a wedding ring design that compliments the groom’s and bride’s ring design. Is that firing up your brain? Share it with us and we’ll help you find the best wedding rings tailored to your preference! What are the risks of getting a custom ring? Why do people say custom rings for a wedding is not for everybody? Is it bad luck to design a wedding ring on your own? Find out below! While the cost of a wedding ring design depends on the choice of metal, stone, and size, custom wedding rings are always costlier. If you saw a design that you want to improve, estimate a rough cost of 3x for the same ring with addition tweaks when going for a custom wedding ring design. It goes without saying that custom wedding rings are not included in the return policies of the jewelers. Regardless of how cordial the seller was; you can’t return a custom ring. It is also irreplaceable unless you save the ASET or 3D images of the ring. Be sure to get your custom ring appraised if you don’t want to lose the idea forever! Custom Wedding Rings are taken more time on your part. It’s not just the jeweler who has to spend time designing, but the process requires to-and-fro consultation on your part too. Be aware, custom rings take a month or even 6 months to produce, unlike a ready-made ring you can pick off the shelves. It is Time-intensive! It’s you who should decide whether a custom ring is right for you. What have you decided? 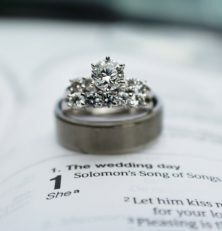 Personally, I love custom wedding rings. The higher cost always sounds worth the uniqueness. Also, when I proposed my girl with the custom solitaire ring set in a tension setting, she was ecstatic.